When a family is supported in addressing ALL of their needs, amazing changes are possible! 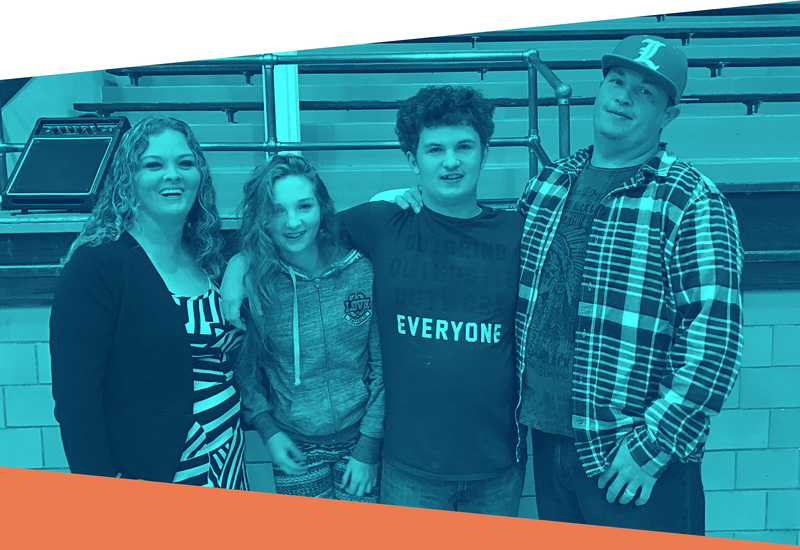 Rebecca and her family got the help they needed to overcome addiction, gain steady employment, improve their educational environment, and secure their own home. In 2015, Rebecca began volunteering with The Salvation Army Center of Hope for community service hours through the Kentucky Transitional Assistance Program (K-TAP). K-TAP provides financial and medical assistance to families in need and also helps families find jobs or get training that leads to a job. While volunteering, she learned about the Siemer Pathway of Hope program and was hired as a receptionist for The Salvation Army. Initially, she met with a mentor and was doing well but soon started missing work and eventually lost her job because of her absences. Rebecca said she was ashamed and felt she had let others down. She admitted to her case worker that she and her husband, Kevin, were addicts. Seeking help through the Salvation Army Family Emergency Shelter, Rebecca and Kevin entered detox and began attending 12 step meetings and working with sponsors. Rebecca soon gained employment and was promoted to supervisor within a couple of months. Her kids, Kevin Jr. and Destiny, made a planned transfer to Jeffersontown High School in hopes it would be a better learning environment for them. The entire family began going to counseling together. And recently, Rebecca and her family signed a lease and will soon get their keys to move into their new home. Most importantly, both Kevin and Rebecca have remained clean and sober for over eight months and continue to work their recovery programs every day. Through the Siemer Pathway of Hope program they will continue to receive case management, financial literacy classes and food assistance. When they move into their home they will receive help with furniture and ongoing client assistance – which means their entire family will be more secure and stable – an important consideration for their children’s success. Making sure every child and family has the opportunity for a better life and on their path to self-sustainment is a crucial part of what Metro United Way does. For more information about our family stability work, please contact john.nevitt@metrounitedway.org.